This past summer I had the opportunity to meet cicada expert Bill Reynolds. 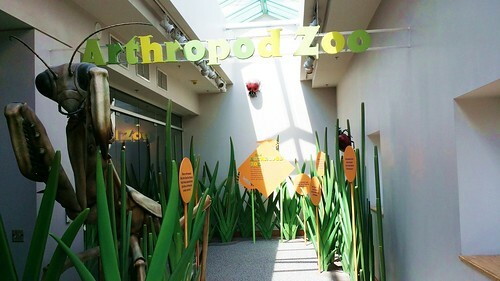 Bill manages the Arthropod Zoo at the North Carolina Museum of Natural Sciences in Raleigh, North Carolina. Bill’s specialty is Neotibicen (formerly Tibicen) cicadas. Neotibicen are a genera of broad-headed, medium-sized, well-cammouflaged cicadas that belong to the tribe Cryptotympanini. I met Bill at the museum and allowed me to view his massive collection of Neotibicen — box after box of cicadas, all carefully pinned and labeled. See a small portion of Bill’s collection. Later we went for lunch, and listened for N. winnemanna hybrids in the neighborhood surrounding the museum. Close to the entrance of the museum, we heard a cicada that started with the call of the N. winnemanna and ended with the call of N. linnei — likely a hybrid. Around the museum neighborhood we heard other cicadas that sounded like a N. winnemanna but not quite. Very interesting. Personally, my methods of catching cicadas are: 1) waiting until dark and grabbing them when they are still nymphs or eclosing, 2) grabbing them by hand on a tree or in flight, or 3) waiting for them to die, and collecting them from the ground. Bill introduced me to two new methods: 1) netting cicadas, and 2) finding cicadas under lights in parking lots. I own a net (purchased from BioQuip) but I haven’t practiced using it. Bill Reynolds is a master of spotting and netting cicadas. He uses a net with 3 or 4 extension poles, which I belive gives him a 20′ reach. Bill is a cicada netting ninja. In a small, roadside patch of trees he caught three N. winnemanna in a matter of minutes. Finding cicadas under parking lot lights require you to cruise shopping mall parking lots on hot summer nights. Wait until midnight, and slowly drive behind malls looking for cicadas clinging to walls or resting on the ground. It is simple as that. Here is a N. lyricen engelhardti found by Bill. Whenever catching cicadas you should be respectful of private property, don’t cause a disturbance, and be mindful of local laws.